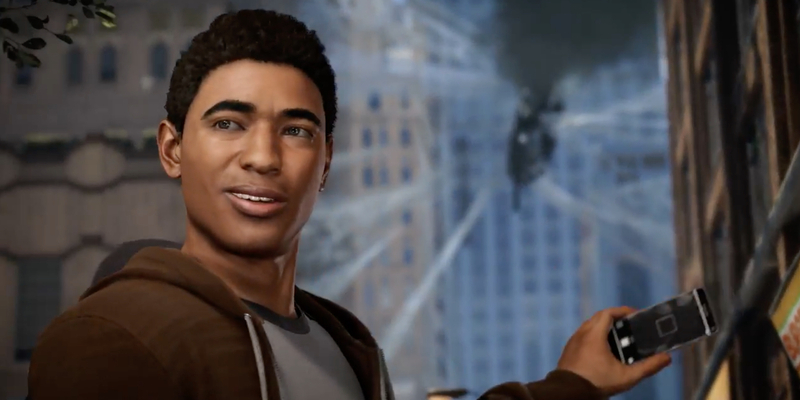 Miles Morales is in PS4's Spider-Man Game! In a shocking turn of events, it has been revealed that Miles Morales will play some kind of a role in Marvel and Insomniac Games' Spider-Man PS4. The news came during today's official Sony Press Conference at the 2017 E3 Gaming Convention, and to say that Spider-Man was one of the most hotly-anticipated titles rumored to be making an appearance throughout the presentation would be an understatement. After all, Insomniac and Marvel made a huge splash in the gaming community last year, when they premiered the first official reveal trailer for Spider-Man PS4, with better graphics and gameplay mechanics than any of the previous Spider-Man games had ever offered. Fortunately, fans were not let down by the Sony conference either, with Insomniac and Marvel unveiling 9 minutes worth of new, never-before-seen gameplay footage from Spider-Man PS4. And in case the actual gameplay itself wasn't enough to quench the thirst of Spider-Man fans everywhere, the studios had another surprise in store with their newest offering from the game. Now, up until this point, there had never even been any indication that Spider-Man PS4 would feature any versions of the character that weren't Peter Parker. To be fair, this small piece of footage doesn't do much to tell users what kind of a role Miles will actually play in the game either -- if he'll just be a fun side character that doubles as a loving wink to comic book fans, or if he'll actually become an integral part of the game's story as it evolves. Is it possible Peter will adopt a mentor-like relationship with Miles like he does in the comics? Will he be a playable character at some point in the game? At this point, it's hard to know for sure, especially since so little about Spider-Man PS4 is known right now. That's also not to mention the fact that, based solely on his appearance here, Miles doesn't appear to have his spider powers as of yet, even despite looking slightly older than the character did when he was first introduced in the comics. So for right now, it looks like Miles is none other than yet another reason for Spider-Man fans everywhere to get excited about what Marvel and Insomniac Games are cooking up with Spider-Man PS4. In fact, this reveal, no matter how minimal it may be, almost even softens the disappointing announcement that fans will have to wait until sometime next year to actually play the game itself. Almost. Spider-Man PS4 will be released in 2018.